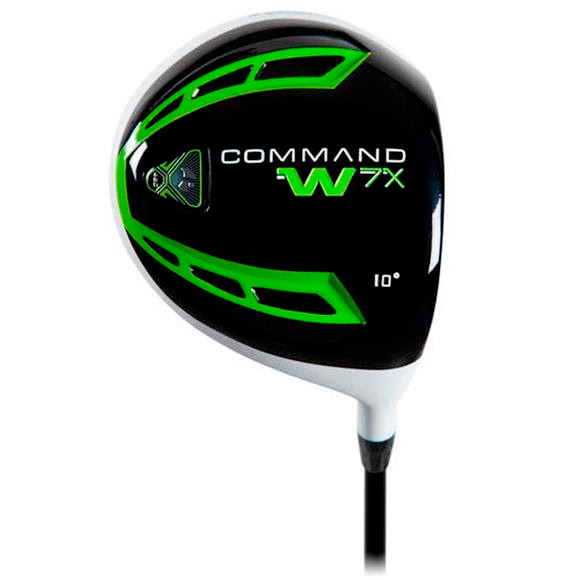 The Pinemeadow Golf Command W7X driver features aerodynamic speed slots in the sole of the club to increase head speed which will improve distance. As you may be aware, white has become a popular color in golf. The Pinemeadow Golf Command W7X driver features aerodynamic speed slots in the sole of the club to increase head speed which will improve distance. As you may be aware, white has become a popular color in golf. There is a reason why clubs heads are being designed with a white finish: the white finish on the crown improves the visibility of the head and helps you align the driver off the tee, helping you hit more fairways and improve accuracy. Join the pros, get the newest advantage for your game. This driver is made out of Ti-Alloy material. It is different than titanium. Ti-Alloy products are Aluminum products with trace elements of Titanium to get some of the benefits with a far lower cost for entry or beginner level players.